Spice up your summer BBQ or potluck with our amazing selection of Asian condiment dispensers! Our collection has Japanese soy sauce dispensers of all shapes and colors. If you want a more contemporary look, consider our Contemporary White Ceramic Sauce Dispenser or our Blue and Black Blended Soy Sauce Dispenser. Feel free to browse between our adorable owl Japanese soy sauce dispenser and our ceramic soy sauce dispensers with Chinese characters on them. 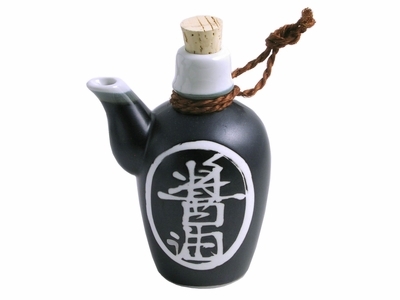 Just one little soy sauce dispenser can add a personal touch to your dining table! Paired with a matching Asian saucer, a Japanese soy sauce dispenser can give your table a total makeover. Even if an incredible chef is making your food, adding that extra pop of flavor with a condiment is very important. Give your dinner guests the flexibility to season their food with a wonderful ceramic soy sauce dispenser. Finding the perfect condiment dish to complement an aesthetically pleasing meal is always a challenge. Rid yourself the hassle of trying to find a substitute for an elegant soy sauce dispenser! Our soy sauce dispensers will take the stress out of setting the table and will make every condiment-lover that much happier.